The UL SmartConnect is a handheld, wireless and portable test tool for acquirers and terminal vendors to test and certify payment card acceptance devices. The compact, wireless and portable SmartConnect testing device is used for contact and contactless card simulation and card spying. This innovative device lets you easily set up a cable-free test environment and control your card acceptance device testing using a wireless connection. The UL SmartConnect uses Bluetooth technology and requires no physical cables when performing tests on your card acceptance device terminal. The UL SmartConnect works seamlessly with UL’s payment acquiring test tools, UL Card Simulator and UL Brand Test Tool, providing the user with automated test execution and test card simulation, covering contact and contactless card images, including images for Visa, MasterCard, American Express, Discover, Diners Club, JCB, and Union Pay. Combined with UL Card Spy it offers real-time spying the communication, including measuring the transaction time performance of your contactless terminal. The UL SmartConnect is a handheld test tool used for testing card accepting devices. 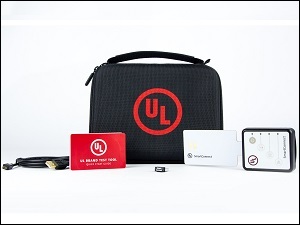 UL SmartConnect features contact and contactless card and mobile simulation, as well as spying and performance measurements. UL SmartConnect supports ISO 7816 on the contact interface and ISO 14443 (type A & B) and MIFARE on the contactless interface. This battery powered device connects via Bluetooth to a mobile device, tablet or laptop running a UL test tool to control and manage it, for instance UL Brand Test Tool. The SmartConnect is part of the SmartTesting portfolio developed by UL. The portfolio consists of dedicated hardware components for testing smart cards and terminals (POS and ATM). These include UL SmartStripe (for magnetic stripe emulation), UL SmartLink Box (for contact chip emulation) and UL SmartWave Box (for contactless card and NFC mobile phone emulation). ATMs and other devices equipped with a motorized reader with a shutter can be tested with Smart ATM Test Cards. The UL Brand Test Tool (UL BTT) allows you to validate the configuration of your EMV terminals - both Automated Teller Machines (ATM) and Point of Sale (POS) terminals. It offers the required tests to verify acceptance of EMV cards for Visa, MasterCard, American Express, Discover, Diners Club, UnionPay and JCB. Use UL BTT to verify that you have an EMV-compliant and payment association-certified terminal that can perform trouble-free transactions within your payment infrastructure. The UL Integrated Test Automation Module is an extension to the Brand Test Tool. It allows to create a fully automated terminal test environment combining the Brand Test Tool with your proprietary test automation environment, linked to your test automation environment using a TCP/IP connection. If your test automation environment is capable of simulating ‘physical’ behavior (such as key entry), you are able to run a full brand certification test without the involvement of a test operator. UL Card Simulator The UL Card Simulator simulates the real behavior of a payment card without the need for any physical magnetic stripe or EMV cards. It simplifies the terminal testing procedure in many ways, mainly by eliminating the dependency on EMV issuers and schemes for physical test cards. UL Card Simulator includes support of card images for brand testing of Visa, MasterCard, American Express, Discover, Diners Club, UnionPay and JCB. The UL Card Spy is able to spy the communication between a smart card and POS terminal. It helps you to view the card-to-terminal messages and vice versa and to pinpoint any interoperability-related issues.